Are you making the most of life or do you sense that something is missing? A keen awareness of this present moment, as it is, and real gratitude for it, will bring you ever closer to the joy you long for. This is a collection of beautiful poetic verses, inspired by Eckhart Tolle. Jen applies universal ideas, transforming the everyday into something heart-warming, hopeful and joyful. Her insights will help you to learn more about giving and receiving love and the rhyming nature of her poems will connect you with your intuition and inner wisdom. Everyone from five-year olds to centenarians will find inspiration, truth and hope in these insightful real-life transformations that all of us can relate to. There are different ways to engage with Life's a Mango. You may use the contents pages as a guide or randomly open the book and see which wisdom picks you, at this moment! Mandalas to colour in are found at the back of the book as well as blank journal pages for you to write or draw your reflections of the poems. You may enjoy learning some of the inspirations off by heart and delighting family or friends with a recital. Just as you add colour to life, so too can you add colour and character to this book by colouring the trees, the mandalas as well as writing your own words or poems on the blank pages. 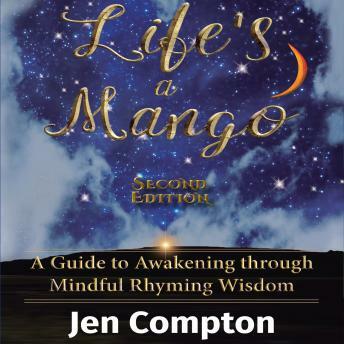 May Life's a Mango be transformed into something very personal, just for you.